The use of the different metals together isn't arbitrary, or at least not originally. About 2-300 years ago it was common for diamonds to be set in silver. Jewellers of that time believed that only a silver mounting could render the true beauty of a precious stone. the backs of these jewels were for the most part gold. This silver on gold technique where the back of the silver jewel was covered by a very thin layer of gold, was developed as a precaution, taken because jewellers of the time knew that silver jewellery could leave black stains on clothing or skin. There are some very beautiful examples of this sort of jewelry. Click here to see what we have in our collection of these type of jewels. Because the craftsmen had gotten used to using two layers of metal in different colors, they continued to do this at the end of the 19th - beginning of the 20th century, only by then they were no longer using silver but platinum. Platinum, a precious metal as expensive as gold, doesn't leave any black stains, so the use of gold with it was for aesthetic rather than practical reasons. The use of two different colors of metals can still be found in jewellery from the 1940's (the so-called Retro style). Click here to see what we have in our collection of these type of jewels. Platinum has not always been considered to be a precious metal. Moreover, in Russia in the beginning of the 19th century, counterfeiters used platinum as the core for their "golden roubels", this because of platinum's high gravity. 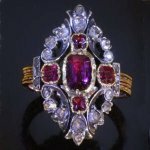 When, around 1870, platinum started to be recognized as a precious metal the price of it rose accordingly, it is told that roubels were then cut in half in the hope of finding platinum inside.... Even if it is not true, it still makes a cute story.